‘The next day as they were leaving Bethany, Jesus was hungry. Seeing in the distance a fig tree in leaf, He went to find out if it had any fruit. When He reached it, He found nothing but leaves, because it was not the season for figs. Then He said to the tree, “May no one ever eat fruit from you again.” And His disciples heard Him say it. Today Monday the 2nd day in the Passover Week. For those of you who follow this Devotional Blog, you saw yesterday; Palm Sunday was the day of Jesus triumphant entry into Jerusalem. Jesus answered, “Yes, haven’t you ever read, ‘Out of the mouths of babes and sucklings thou has perfected praise’? Jesus quoted this from Psalm eight. What made the Priests so angry was that they knew very well what Hosanna meant and where it came from. It was a direct quote from Psalm 118:24. And so the chief priests and the teachers of the law heard this and began looking for a way to kill Him, for they feared Him, because the whole crowd was amazed at His teaching. When evening came, Jesus and His disciples went out of the city. Won’t you join me as I chronicle, day by day this entire Passover week, reading through Scripture’s account as we trace Jesus’ footsteps as He went forward towards the Cross and His Resurrection. Today, Monday, begins the 2nd Day of the Passover week and we find Jesus and His followers the day after Palm Sunday. Here in the Gospel of Mark we see two major events recorded. 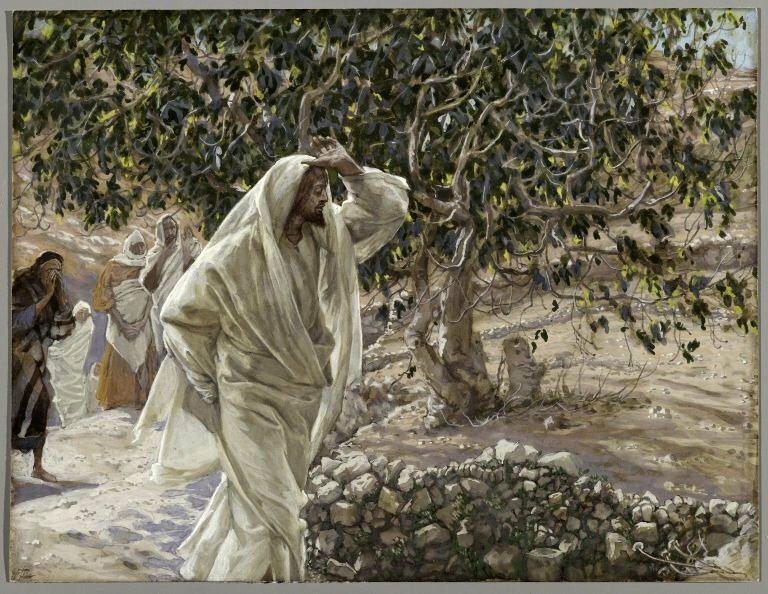 The first, as Jesus along with His disciples walk toward Jerusalem as He sees a Fig tree along the road, and Second, as He arrives in Jerusalem at the Temple. Monday morning finds Jesus leaving Bethany which was about two miles East from Jerusalem. It is most likely, although not recorded that Jesus and His disciples returned back to Bethany Sunday night after the celebration of that Palm Sunday. Since Jesus could often be found at His friends; Mary, Martha, Lazarus’ home; it is probable that is where He stayed for the night. The next day, Monday, we find Him leaving Bethany and returning to Jerusalem; a distance of two miles. Along the way, Jesus cursed a fig tree because it had failed to bear fruit. Some scholars believe this cursing of the fig tree represents God’s judgment on the spiritually dead religious leaders of Israel at that time; while others believe it is symbolic to all believers, demonstrating that genuine, living faith is more than just outward religiosity. Alfred Edersheim has called attention to the fact that “in Palestine the fruit appears before the leaves . . .” and so to actually see a leafed fig tree would mean that there would also be the fruit. The strangeness was that there were leaves, but the tree was fruitless. We will see later this week as Jesus returns back to Bethany how He used this fig tree as an illustration to the parable of the fig tree. Next we find Jesus arrival to Jerusalem where He goes to the temple. “On reaching Jerusalem, Jesus entered the temple courts and began driving out those who were buying and selling there. Jesus arrives at the temple in what would be the only time mentioned in the Gospels where He ever used physical force. The courtyard is described as being filled with livestock and tables of the money changers who would change the standard Greek and Roman money for Jewish money, which was packed with people attending the Passover celebration. Jesus creating a whip from chords, ““drove them all out of the temple, with the sheep and the oxen, and poured out the changer’s money, and overturned the tables; but He said to those who sold doves, “Get these out of here! Do not make My Father’s house a house of trade!” John 2:13-16. The big question for me as I’ve read this passage through the years has always been Why? 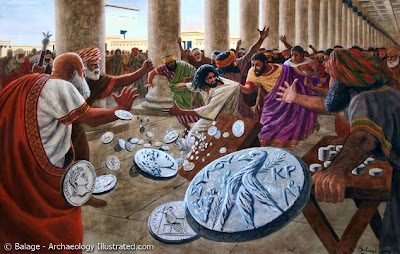 Why did Jesus use physical force to move the money changers out of the temple? I’m sure there are many different points of view on this, but just to throw out my own, I feel that it was because He was righteously angry with the way the religious leaders had turned what should have been a ‘House of Prayer’ into a ‘den of thieves’. These leaders were actually receiving ‘kickbacks’ form vendors to position themselves in key spots where they would take advantage of the pilgrims coming in to purchase their lambs, oxen, doves to fulfill their offer of worship before God. Basically, they were guilty also of adding an additional burden onto these worshipers, making them pay more than they needed to. It is my conviction that Jesus was passionate about this place and what it symbolized. The sad reality that the Lord’s people had strayed away from the real purpose of the building. Not to make a profit. Not to live ‘high on the hog’; but for the religious leaders to prepare a place, of God and make it accessible to all who would come and desire to worship God. Today, as a church; we are strangely close to this scenario. The house of God is no longer in buildings; but within every man and woman who receive Jesus Christ as Lord and Savior. The burning question for me is: If Jesus were to come by and inspect my house, His temple; what would He see? Would it be a house that has not sold out to a lukewarm condition and one where Jesus finds Himself outside, knocking on the door to come inside. Can I say that Jesus Christ is still my first love? Really? God help me, that my own heart has not and will not be seen by you as a ‘den of thief’. Jesus desires that we come to Him, not avoid, neglect, ignore Him. For whatever ales us, we can come and pray, and ask Him to ‘turn over the tables’ if need be; all that we would bring Him back into focus and allow Him to establish the right perspective. My prayer is that I would not be found as a ‘fig tree’ with leaves but without fruit. That I would not be found as one who looks religious on the outside and empty within. This is a great week to reflect, and meditate to what extreme Jesus went that we be in the right place, with Him. What a challenging question! this convicts my heart too! Thank you for sharing these insights!